Chris Hansen’s Sodo group has proposed to also renovate KeyArena into a mid-sized concert venue. In making its latest proposal, the Sodo group, led by Chris Hansen, said it was offering an alternative KeyArena solution in the event its project is ultimately approved. But the city’s Office of Economic Development issued a terse “no thanks” to the offer in a statement. A group proposing to build an arena in Seattle’s Sodo District on Thursday offered a privately funded plan to renovate KeyArena into a smaller-sized concert venue. The proposal, said to be for $90 million to $100 million, was almost immediately shot down by the city, which is already finalizing a draft Memorandum of Understanding with the Los Angeles based Oak View Group (OVG) to renovate KeyArena for $564 million for NBA and NHL teams and large-scale concerts. That draft MOU is to be forwarded to the Seattle City Council next Tuesday with possible final approval by year’s end. In making its latest proposal Thursday, the Sodo group, led by entrepreneur Chris Hansen, said it was offering an alternative KeyArena solution in the event its project is ultimately approved. 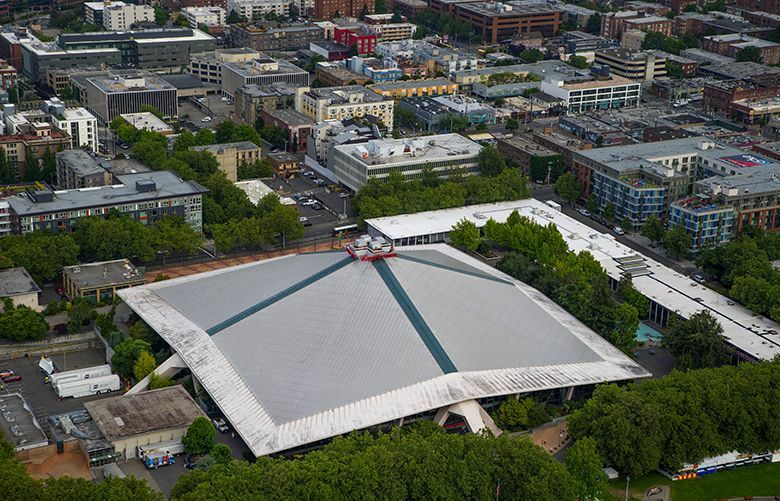 But the offer seemed unlikely to generate positive city response, given how it feels it already has that solution after spending months undergoing a Request for Proposals (RFP) process to renovate KeyArena into a major venue — not a downsized one. The city’s Office of Economic Development issued a terse “no thanks” to the offer in a statement that read: “If the Sodo Arena group was interested in redeveloping KeyArena, they should have submitted their proposal during the RFP process, which would have shown a willingness to work with the city on this project. The RFP process was launched in January and asked for offers to renovate KeyArena into a “world class” venue for concerts, the NBA and NHL. OVG and the Seattle Partners group submitted rival bids, with the company led by Tim Leiweke and Irving Azoff getting the city’s pick. Hansen’s group, in the meantime, revised its plans to use up to $200 million in public-bond money for its Sodo project and asked the city to reconsider its previous request to be sold a portion of Occidental Avenue South. The group needs the street to complete its arena land acquisitions but was previously denied an initial request in a 5-4 city council vote in May 2016. The group has switched to an all-private offer to build a $600 million arena but has yet to complete its group of financial investors and says it would not build without teams. No would-be NHL owner has partnered with Hansen’s group, and the NBA has suggested expansion or relocation might not happen for several more years. It’s doubtful the Sodo group’s offer to renovate would have survived the RFP process because it doesn’t conform to what the city requested. Instead, it offered to downsize KeyArena by splitting it in half to create a 6,200-seat indoor concert venue on one side and a 3,000-seat outdoor covered amphitheater on the other. A 500-seat music theater also was proposed. Hansen’s group said the KeyArena redevelopment would occur after construction of a Sodo arena. The idea of a split-venue KeyArena remodel was first proposed in a 2015 city-commissioned report by the AECOM architectural firm that studied future uses for the building. Unlike other rejected future uses, the split-model facility was one of the few in which KeyArena was projected to have a shot at breaking even financially on a year-to-year basis. But that suggested venue was for both sports and music and came with a price tag pegged at roughly $150 million. At the time, AECOM expressed doubts that any private entity would fund such a renovation, given the cost and the relatively low returns. Instead, the full-fledged renovation for NBA and NHL was seen as the only way to attract private investors to foot the bill and allow the city to continue seeing profits from operations. Hansen’s KeyArena proposal is for music alone, which likely kept the costs lower. The council had planned to study Hansen’s latest street-vacation request this fall, but with no teams imminent for Sodo — meaning construction wouldn’t begin for some time — the decision was made to put that on hold to focus on the OVG offer to renovate KeyArena without needing teams first. Other local teams and event planners in Sodo — including the Mariners, Seahawks and Sounders — had asked the city to insist that Hansen be made to sign a binding agreement on event scheduling before a new council vote on Occidental. Hansen’s group said an initial deal struck last year is good enough. The city had stated that the request for a binding event scheduling arrangement — and the lack of one — would be part of its consideration on whether to recommend that the council approve selling the street.